There's no greater joy than coming home from a hard day's work and being greeted by a property that boasts of your fine taste in aesthetics and functionality. As we have worked on so many driveway installation projects before, we've come to realize that our clients in Phoenix and all over the state of Arizona are willing to go the extra mile to guarantee that their property stands out. More importantly, our extensive years of experience as a certified member of the Interlocking Concrete Pavement Institute also taught us that installing driveway pavers is one of the easiest ways to bring lasting beauty and functionality to any property—including yours. We service the following cities and their surrounding areas: Scottsdale, Paradise Valley, Cave Creek, Carefree, Peoria and Phoenix, Arizona. 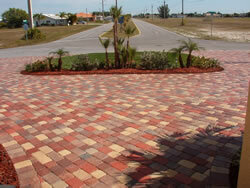 As we've said, driveway pavers can instantly make your home stand out from the rest of your neighborhood. This is thanks in great part to the wonderful aesthetics and utilitarian benefits that pavers provide. Amazing durability. Unlike other materials, pavers are tried and tested to last for years and decades. This is due to the innate strength of the material—pavers can withstand even the harshest of weather conditions. Unlock poured concrete, pavers can expand and contract with temperature changes. Given Arizona's extreme weather, this is something that you'll surely appreciate in the long run. Easy maintenance. No homeowner wants to spend time, effort, and resources just to keep his or her driveway in tip-top shape—and we're definitely certain that you, too, don't want to experience any hassle. The good thing about driveway pavers is that they're virtually maintenance-free, so you'll save not only time and strength, but also a good deal of money. Stunningly beautiful. Our clients rave about the sheer beauty and elegance of pavers. With the wide array of sizes, shapes, and colors, achieving the perfect driveway is easily at your fingertips. Here at Phx Pavers & Landscaping, we use concrete driveway and brick driveway pavers in our paver installation projects. Whether it is courtyard pavers that we're installing, or a concrete paver driveway, we can assure you that you'll get your money's worth. Our concrete pavers are durable and beautiful because we only use the products of Belgard—the leading paver products provider in the country. Additionally, the options, color selection, and textures that we offer guarantee that all these will result in amazingly paved driveways and courtyards. As a licensed concrete paver contractor in Arizona, we're mighty proud of our stunning portfolio, solid experience and loyal client base. These make us confident that we can provide quality driveway installation. We're also experts in creating outdoor structures and hardscape elements that meet or even exceed industry standards. We can work on any type of paving installation from your patio, walkways, and driveways. Our insatiable passion for excellence and total client satisfaction make us hungrier by the day to think of ways on how we can make our products and services even better. 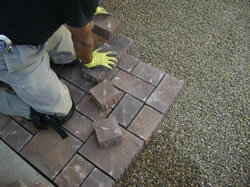 So for your driveway and courtyard pavers needs, rely on Phx Pavers & Landscaping. We will assure you that it will be one of the best decisions that you'll ever make.